“Love to Nippon 2019,” commemorating the eighth anniversary of the March 11, 2011 earthquake and tsunami that struck northeastern Japan, will be held on Sunday, March 10, at 12 p.m. at LAPD Headquarters, 100 W. First St. in Downtown Los Angeles. 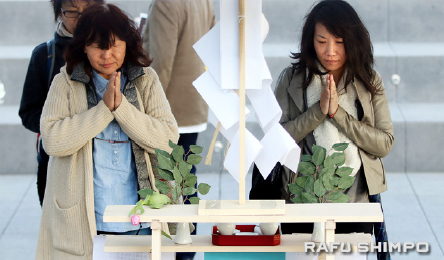 The irei-sai (memorial service), co-hosted by Shussei Inari Shrine of America, will take place from 12 to 12:30 p.m. There will be performances by UCLA Kyodo Taiko and a flamenco dance tribute by Mikaerakai Flamenco. L.A. Fire Chief Daryl Osby will make a special presentation on natural disaster preparedness at 2 p.m.
Love to Nippon will also hold a candlelight prayer for the victims of the disaster on Sunday, March 10, at 9 p.m. on the north side of the Santa Monica Pier, 200 Santa Monica Pier A in Santa Monica. The earthquake struck at 2:46 p.m. on March 11 in Japan, or 9:46 p.m. on March 10 in Los Angeles. Love to Nippon was founded in 2011 by Masako Unoura-Tanaka, a survivor of the tsunami who lives in Marina Del Rey as well as Ofunato City, Iwate Prefecture. Supporters include Nichi Bei Fujin Kai and Douglas Erber, president of the Japan America Society of Southern California.